Sour cream sauce: Mix together the sour cream, chives, garlic, lemon juice (1 tbsp for 4; ½ tbsp for 2) and HALF the zest. Whisk in the olive oil (1tbsp for 4; ½ tbsp for 2). Spaghetti: Place a pot on medium-high heat and add the boiling water. When the water is at a rolling boil, add the spaghetti cook for 5 minutes. You want it al dente, which is slightly chewy and translucent. Drain (reserving 1 tbsp for 4; ½ tbsp for 2 of water) and drizzle with a little olive oil to keep it from sticking together. Saucy spaghetti: Add the reserved water to the sauce (1 tbsp for 4; ½ tbsp for 2) and mix well. Then add the sauce and smoked trout to the veggie noodles and mix through. "This was really tasty, for some reason my sauce unfortunately came out a bit dry (even though I used 1x tbsp of water, instead of a half). 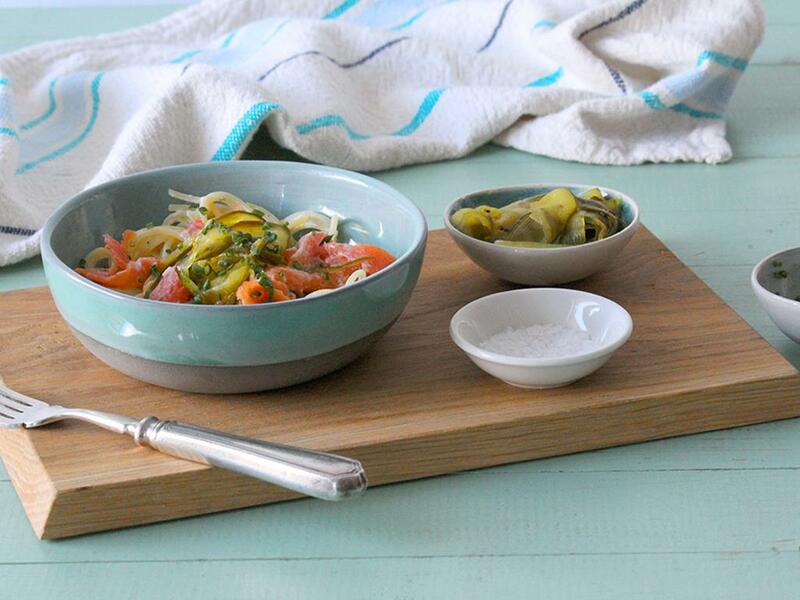 The pickled cucumber was amazing, thank you so much :D"
"Easy and delicious! Needed a bit more sauce I thought."